With the May 2-4 weekend just around the corner, summer is finally upon us. 'Tis the season for patios, parks, barbecues and of course, road trips. In North America, there are no shortage of justifiably hyped up road trip destinations, but sometimes the best spots are just as likely to be under-the-radar locations that don't have much publicity outside their local radii. Alberta is a province that blends those two categories beautifully. It's home to both world-renowned haunts and hidden gems that fall just off the beaten track. We've taken the liberty of singling out some of the standouts. Here are five Alberta destinations worth taking a road trip to. You may have just read that heading and said to yourself, "Wait, I thought this was a list of Alberta destinations?!?." Don't worry, you're not going crazy. In this case, "Saskatoon" refers to Saskatoon berries, not the city in Saskatchewan. They grow throughout the farm and are available to be picked and bought be visitors. But berries—and lots of other fruits—are just one of the many things that make theSaskatoon Farm a worthwhile destination. It also boasts a garden shop and a café that serves, of all things, authentic Mexican food. All the non-farm buildings are designed and laid out to look like an old village Main Street, giving Saskatoon Farm a quaint atmosphere that makes it a prime candidate for weddings and other special events—not to mention cooking classes with local produce. Imagine two jagged expanses of rock that sit at the mouth of a powerful, sprawling river. They edge into the river's mouth from opposite sides, but leave just enough space for a narrow, concentrated stream of eddying whitewater to plummet down a precipitous drop, leading into a tight path of rapids that would resemble an amusement park log ride if it wasn't so glacially cold. 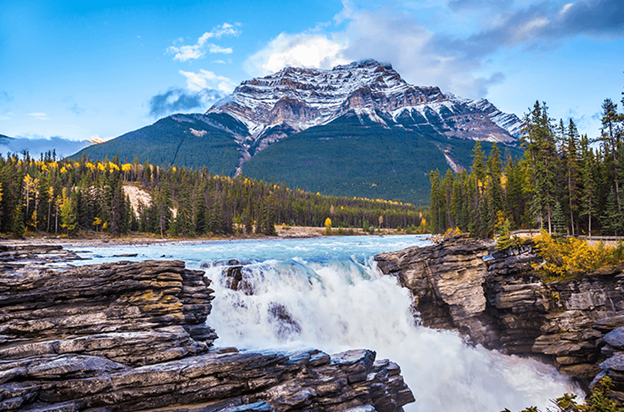 What you are picturing is the Athabasca Falls, a premier attraction in Alberta's Jasper National Park. At nearby lookouts you can watch the mighty display of the falls from a prime (and safe) vantage point. Then head over to the winding staircase path that takes you through the old Athabasca Falls. The water is gone but the gorgeous ridged surfaces that it inscribed on the surrounding rocks still remain. Banff straddles the fence between thriving cultural centre and breathtaking wilderness paradise like no other—just ask the Banff Bears high school rugby team that had theirpractice disrupted by an actual grizzly bear last weekend. The town of Banff has a hospitality-based economy that draws in vivacious travelers from all around the world as both visitors and workers. It is also home to the Banff Centre for Arts and Creativity, an acclaimed hub for artistic endeavours of all varieties. But none of that would be possible without the sublime experience that is Banff National Park. Hike the mountainous trails, go whitewater rafting in the rivers, unwind in the soothing hot springs; it's all first-rate outdoor activity. Tucked in the heart of the Alberta Badlands on the stretch of the Red Deer Valley called "Dinosaur Valley" is the town of Drumheller. As that nickname suggests, Drumheller is Dinosaur Country. It exists as a relic of the former tenants that once occupied the land in the Jurassic Age. Visitors can search for bones outdoors with paleontologists and see the mesmerizing skeletons on display in the Royal Tyrrell Museum. And if they're dinosaur-ed out, there's lots of other activities available, including a mining car tour of the Atlas Coal Mine National Historic Site. The Cowboy Trail was made for road trips. It is, quite literally, a series of towns, sites, and attractions connected by Alberta's 22 and 27 highways. Passing through the trail is one of the best ways to soak up the culture of the 'Old West.' Park the car for a while and truly dive into the local scene. Hunker down at a ranch, take in a rodeo, hit a trail on horseback. Or just spend a few hours popping into shops and restaurants to check out Western-inspired artwork and dishes.